Explosive Label (Class 1 Label) - Buy Securely Online. The EU has passed numerous directives and regulations to help keep people safe when using and transporting potentially hazardous substances. The Class 1 label is used for marking and identifying explosive substances and articles during transportation. WHAT ARE CLASS 1 Dangerous Goods? Class 1 Dangerous Goods covers explosive substances and articles. The class is further divided into 13 compatibility groups identified by a letter appearing in the centre of the warning diamond. Explosive division 1.1, 1.2 and 1.3 labels are used to identify highly hazardous explosives. These labels incorporate the explosive symbol, the division number (1.1, 1.2 or 1.2) and the letter which indicates the compatibility group. 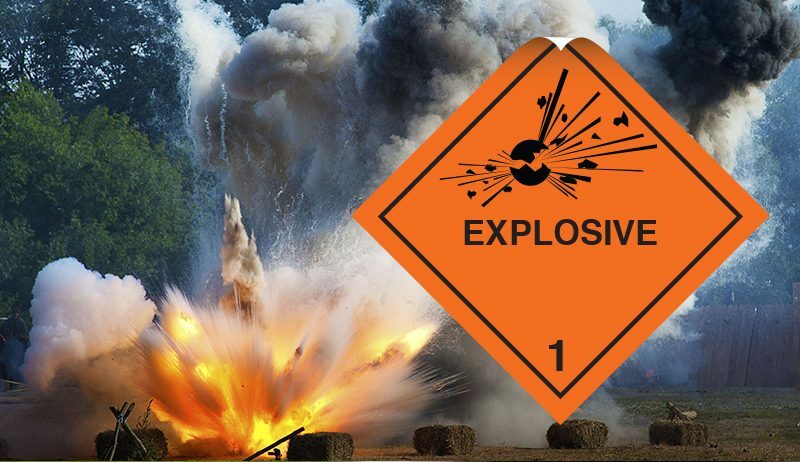 This group covers mass explosives such as dynamite/TNT, projection hazards such as detonating fuses and fire hazards such as flares and shotgun cartridges. Explosive division 1.4, 1.5 and 1.6 labels are the less hazardous divisions. These labels must only display the division number and compatibility group letters, for example: S, D and N. The numerals printed on the label must be at least 30mm high. This group covers insensitive articles and articles with no significant hazard, including such items as fireworks and safety fuses. Explosive articles in tansit can include many wide-ranging items from nitro-glycerine, blasting caps and ammunition, to airbag detonators, and party poppers, and although explosives can behave in a violent way when appropriately initiated, they are purposely designed to be stable and insensitive under normal conditions. This enables them to be handled and transported safely, unless they are subjected to violent shock, or extreme temperatures, though some explosives can be initiated by temperatures as low as 200º. The ADR (European agreement concerning the international carriage of dangerous goods by road) regulations, state that all packages containing dangerous goods should have a warning label and that the label shall be in the form of a square at an angle of 45° (diamond shaped). The Class 1 label for packages must be at least 100 x 100mm, from edge to edge, and set at an angle of 45°. The label must show a black image of the exploding bomb on an orange background. A dotted outer boundary must indicate the edges of the labels (unless it is being applied on a background of contrasting colour). The labels must show an inner 2mm border that is 5mm away from the edge of the labels. The class number ‘1’ must be shown in the bottom corner and be in text at least 12mm high. If the size of the package is too small to fit a 100mmx100mm warning label, then the dimensions may be reduced provided the symbols and other elements remain clearly visible. However, the inner line must remain 2mm thick and must remain 5mm from the edge of the label. The Class 1placard is used for cargo transport units such as freight containers and road/rail tanker vehicles. Class 1 placards must be at least 250mm x 250mm, from edge to edge, and set at an angle of 45°. The placard must show a dotted outer boundary line (unless it is being applied on a background of contrasting colour). The class number ‘1’ must be shownin the bottom corner and be in text at least 25mm high. There is no specification for the thickness of the inner line, as yet, but there must be a gap of 12.5mm between this and the outer dotted border or the outer edge of the label. 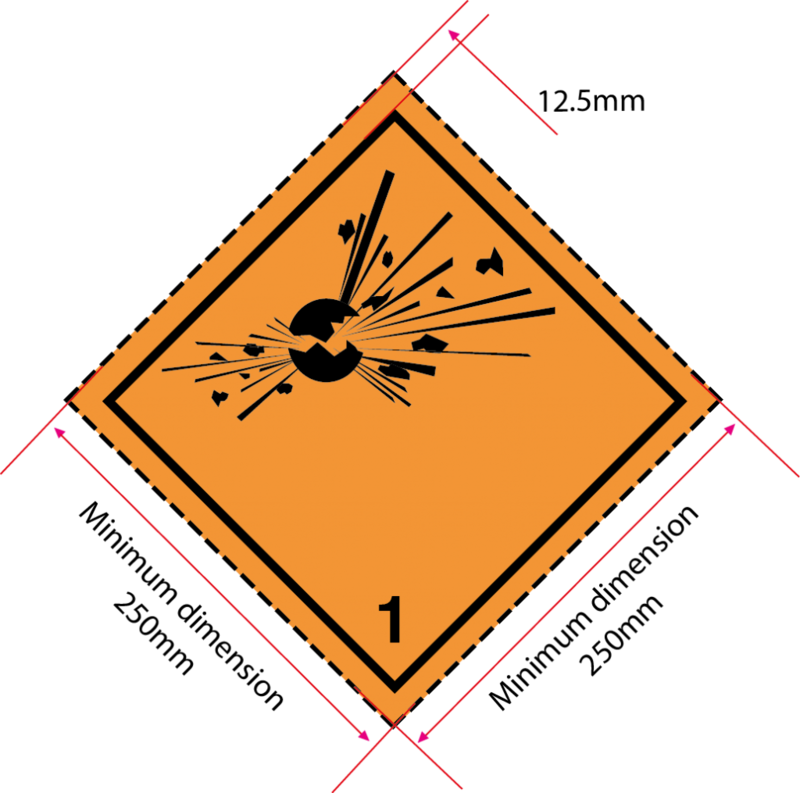 The upper half of the label must the exploding bomb-burst and the Class 1 must be shown in the bottom corner. We manufacture the explosive label at 101mm x 101mm on rolls of 250, and our Class 1 placards, for use in international transportation, are supplied at 250x250mm. All labels are fully compatible with IATA/ ICAO, UN ADR/RID and IMDG/IMO requirements.